When we choose constant contact with the Greater Energy, we forget ourselves less. We forgive more. We honor our nature as spiritual, energetic, relational, and biological beings. We are more patient and compassionate with ourselves and with all beings, for we remember the journey that each of us is on. We identify more with our higher selves and our infinite creative potential, and less with our sense of limitation, woundedness, and powerlessness. View weekly class schedule here. Join me in the final week of our seven-week series exploring the Yoga of Resilience, Resistance, and Recovery. Yoga is a profoundly elegant, comprehensive and holistic system for experiencing vitality, complete freedom, and wholeness. It is a path and process. It is precisely these things – a path, a process, a comprehensive system – that so many of us need right now. We are being called to a level of healing and recovery that is profound and uncharted. We are being called to the Next Level of resistance to oppression, requiring Next Level commitments to resilience as well. Read why we need this work more than ever in these times. In the past few weeks, we been exploring the individual tenets that Durga Leela, founder of Yoga of Recovery, has codified. These tenets help to structure the work of resilience/resistance/recovery by speaking to the nature of human experience – acknowledging exactly where and how we suffer – and pointing to the tools of Yoga, Ayurveda, and the 12 steps which meet us at the level of our suffering. These tenets recognize the natural energies of manifestation/existence/the human condition, as well as the ways those energies can go awry, and the yogas that best allow us to express those energies in a more conscious (sattvic) way. The first tenet, Life is Longing, speaks directly to our innate longing to know our own True Nature, to know Spirit. In Life is Prana, we acknowledge the reality that breath is life, Life Force, Spirit. Then, Life is Relationship teaches us that we are relational beings, and we must accept the imperative of cultivating a relationship with self and other (and god). Next, we learned that Life is Sweet. This tenet reminds us of our biological imperative to seek beauty and sweetness in life, but that we need to find life-supporting ways to seek that taste of love and protection. Last week, we looked at Life is Love. In this tenet, we are reminded that we what love, we serve. That service is love in action. Finally, this week we reaffirm that Life is Progress. This final tenet reminds us that the path to disease and addiction is not a one-time event but a process, and so too is the work of recovery/resilience/resistance. A series of choices that we can make every day to get right with God, get on the right path for us to pursue our svadharma – our life’s work – and begin to reverse the disease process on every level. Health is habits, so we every time we make a choice in keeping with our holistic health and higher purpose, it is a step in the direction of wholeness and healing. A series of such choices creates our experience of wellness, health, vitality and life. One errant choice, here and there, does not dramatically alter our overall blueprint. Our experience of health – or lack thereof – is an accumulation of our habits and choices. 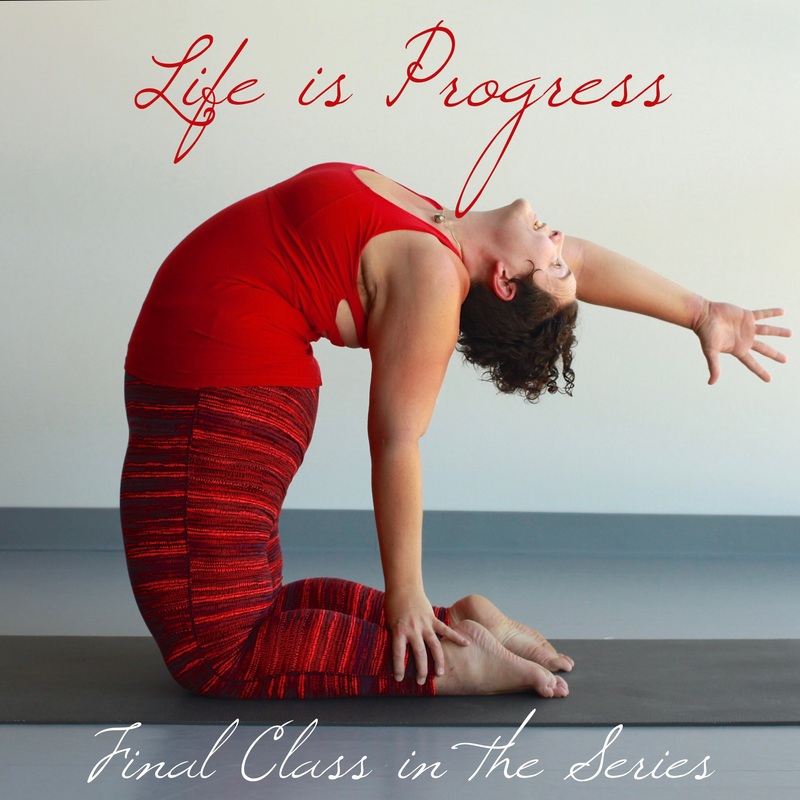 Life is Progress reminds us to keep coming back, to the meetings (if that serves you), to the mat (yoga and meditation), to your daily self-care sadhana (sacred practices), and to a community of like hearts who are on the same journey towards healing and wholeness. It invites us to make conscientious choices, to cultivate conscious and constant contact with our Higher Purpose (Higher Power / God / Grace / Divine / Greater Energy / Source / Spirit / etc). This habit, of all the ones we can cultivate daily, is the one that speaks directly to the nature of disease and illness as described by yoga, Ayurveda, and the 12 steps – a spiritual malady: forgetting our nature is Spirit. In short, we experience our true nature as whole, complete beings. 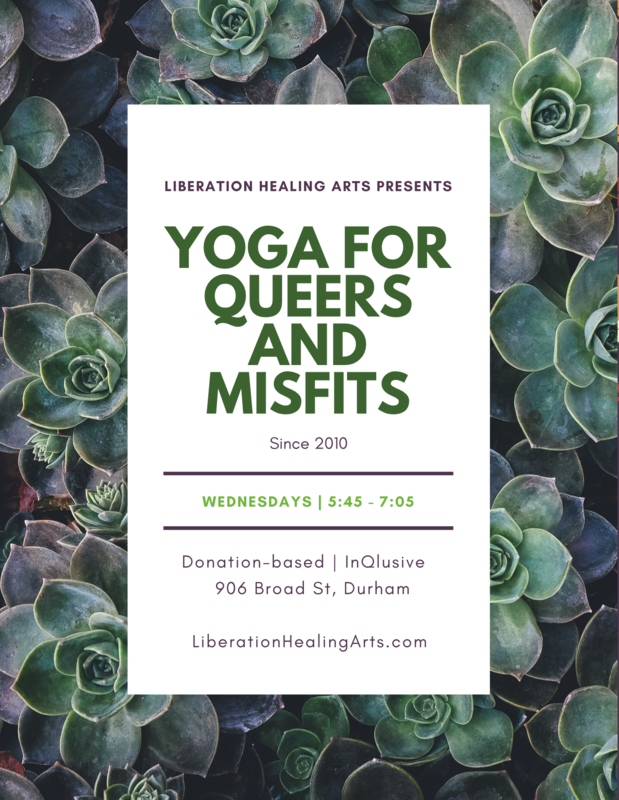 This entry was posted in Uncategorized and tagged all-levels yoga, anti-oppression, community-care, donation-based yoga, Durga Leela, durham yoga, durham yoga company, intersectional, lgbtq, lgbtq yoga, life is progress, patoi roja yoga, patty adams, patty adams yoga, queer yoga in durham, resilience, resistance, self-care, social justice, social justice yoga, trauma-informed yoga, yoga, yoga for queers, yoga for queers and misfits, yoga for queers in durham, yoga in durham, yoga of recovery, yoga of resilience, yoga of resistance. Bookmark the permalink.